Our turning department makes use of advanced CNC and NC machines and is perfectly equipped for the production of turned parts made of any material. 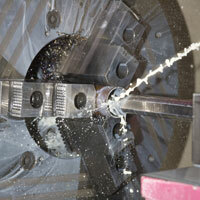 Frequently machined are stainless steel and standard steel, copper alloys and plastics. We can handle diameters up to 1,000 mm and lengths of 2,000 mm. Details of the machine park can be found in Services.